Believe it or not, the end of the school year will be here before we know it. Our hallways are buzzing with excitement and anticipation as we get ready to celebrate a big first for us, not just here at our school, but for BASIS Independent Schools as a whole: our first graduating class! 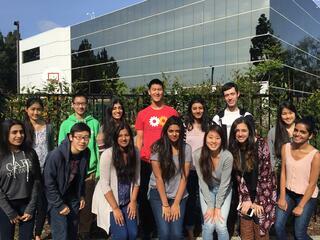 This first senior class in Silicon Valley is composed of a driven group of 14 students, since our admissions team was very selective in identifying candidates qualified to enter the high school as upperclassmen given the challenging curriculum. With our first graduating class comes our first round of college admissions. At our State of the School address in February, we shared with participants some of the preliminary results of the tireless work of our College Counselor, Mr. Chris Wilcox, and our students as they worked together to fulfill college dreams. In their senior year, BASIS Independent Schools students take a daily College Counseling course and place a large focus of their time ensuring they have their best foot forward. We are pleased to share that all college admissions results are in: our very first graduating class has gained admission to some of the top universities in the nation!